Tiny GOTHIC BUTTON POST BLACK BAT EARRINGS - Punk Stud Vampire Costume Funky Jewelry - Mini Plastic charm with Outspread Wings (Dracula's Symbol) for any Halloween Fan or Vampire Collector. Dimensional, detailed miniature Charms, approx. 1/2-inch tall x 1-inch wide. 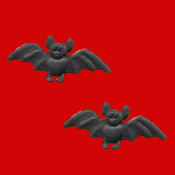 You may go BATTY! Would you like SILVER-tone or GOLD-tone Earwires?